CARACAS - Electoral authorities in Venezuela say the governing Socialist Party has won 17 of 23 state governorships in a crushing victory. 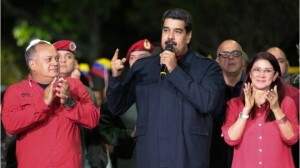 President Nicolás Maduro hailed it as a victory for Chavismo, his party's brand of socialism named after former president Hugo Chávez. But opposition leaders alleged fraud. The Democratic Union Roundtable coalition has refused to recognise the result and demanded a complete audit, campaign director Gerardo Blyde said. He said that "neither Venezuelans nor the world will swallow this fiction". The results were announced by the president of the National Electoral Council (CNE), Tibisay Lucena. The council is dominated by government loyalists and has been accused of pro-government bias by the opposition. The CNE came under fire earlier this year when the company providing the voting systems for July's elections for the constituent assembly said the turn-out figures for that poll had been manipulated. The CNE dismissed those allegations and used a different company for Sunday's vote.